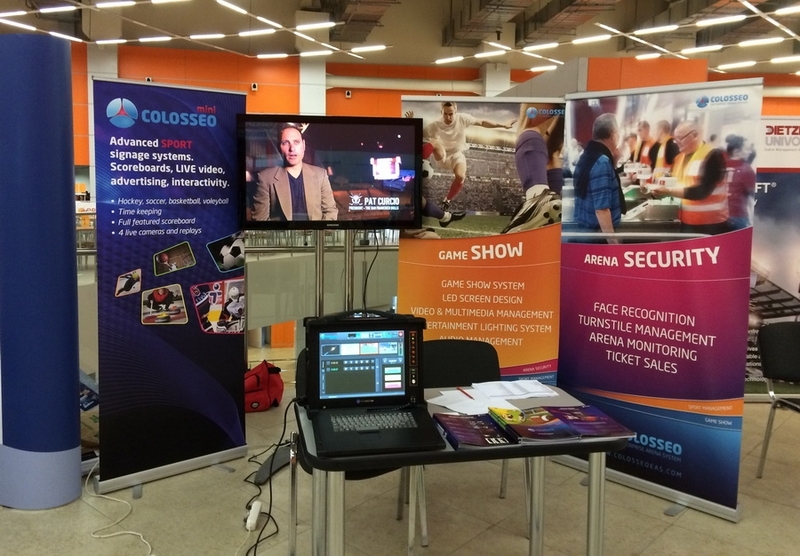 ColosseoEAS was present at the 2nd Annual Russia Stadium Build & Technology Summit that took place from March 25-26 at the All Russia Exhibition Center in Moscow, Russia. Represented by Chief Executive Jan Jenca, Colosseo CIS Sales Manager Tibor Foti and Colosseo’s Russian Director Dmitryi Klimovich, the company displayed a MiniDIRECTOR to more than 1000 event participants and sponsors including arena developers, government agency officials and arena owners. Russia has been named host for the 2018 FIFA World Cup and stadiums and arenas around the country are undergoing infrastructure upgrades and redevelopment to meet the stringent safety and security demands imposed by FIFA while seeking to fulfill visitors’ expectations for an outstanding tournament. Colosseo was represented in the Sochi Winter Olympic Games 2014, supplying a HD LED Octagon Cube in the Shabya Arena. The cube is controlled by a 16 channel Director HD with inputs from live cameras throughout the arena, showing instant replays immediately on the cube and screens throughout the arena and game presentation features like goal celebrations and virtual fireworks. Additionally Colosseo supplied the arena with its HD Video Goal Judge and an Time Keeping System that both comply with IIHF Sport Regulations. ColosseoEAS is a leading international company that specializes in LED design, multimedia and statistics solutions for sport venues. The company’s integrated system approach, introduced in 2010, allows stadium and arena owners to input all data from any source into one platform. Moreover the solution automates tasks, reduces redundant operations and distributes native information to a variety of devices like LED screens, IPTVs, advertising fasciae, mobile applications and even wearable devices.